Creeping along the edge of the schrund, holding on with benumbed fingers, I discovered clear sections where the bedded structure was beautifully revealed [. . .] A series of rugged zigzags enabled me to make my way down into the weird under-world of the crevasse. Its chambered hollows were hung with a multitude of clustered icicles, amid which pale, subdued light pulsed and shimmered with indescribable loveliness. Water dripped and tinkled overhead, and from far below came strange, solemn murmurings from currents that were feeling their way thorough veins and fissures in the dark. 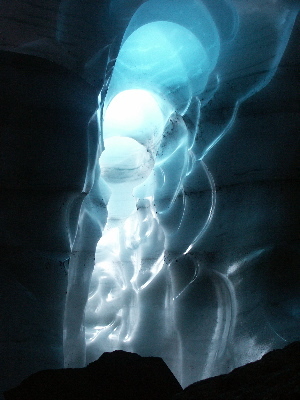 The chambers of a glacier are perfectly enchanting, notwithstanding one feels out of place in their frosty beauty. I was soon cold in my shirt-sleeves, and the leaning wall threatened to engulf me; yet it was hard to leave the delicious music of the water and the lovely light. 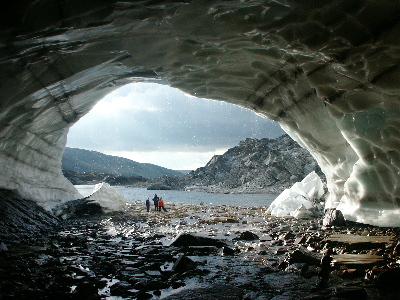 John Muir’s glacier exploration was eventually included in the 1894 volume.